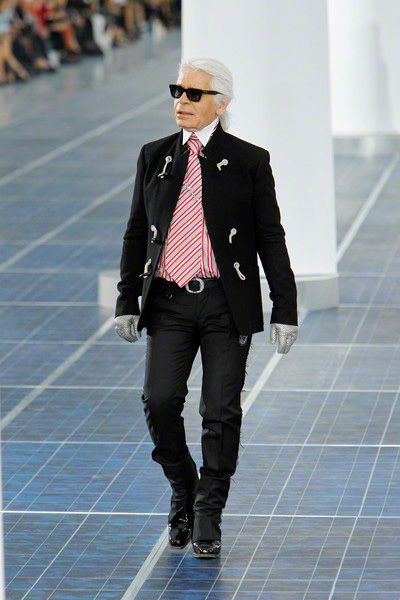 He did a very non sustainable thing a few seasons ago by shipping that ginormous iceberg to Paris, yet Lagerfeld is fully focused on sustainability now. 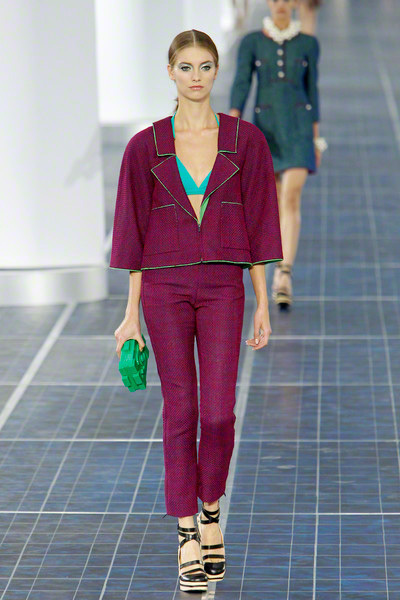 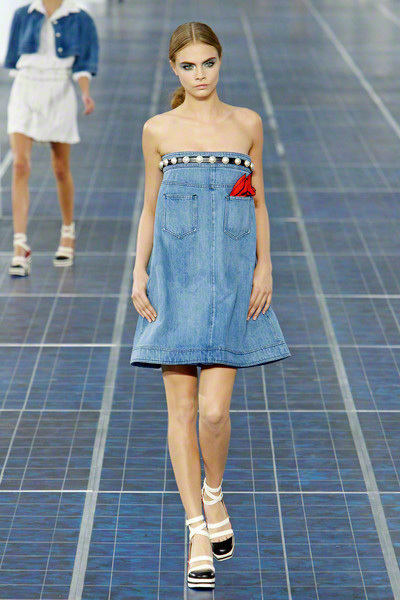 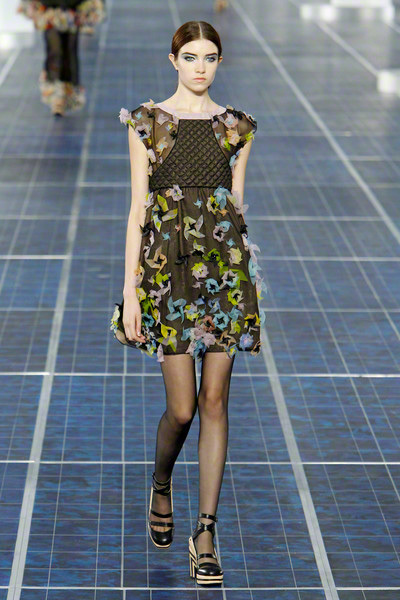 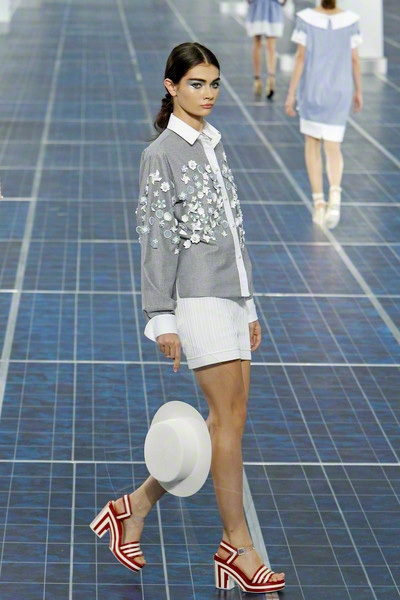 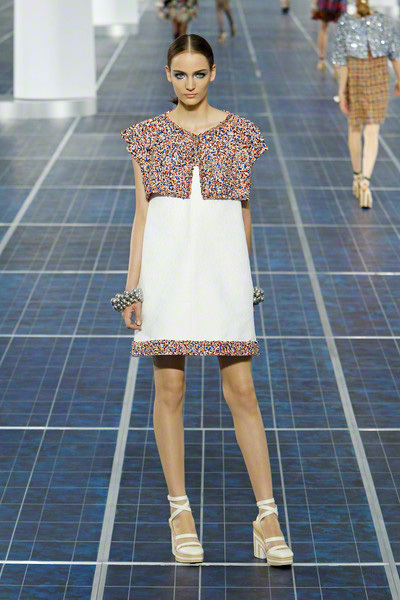 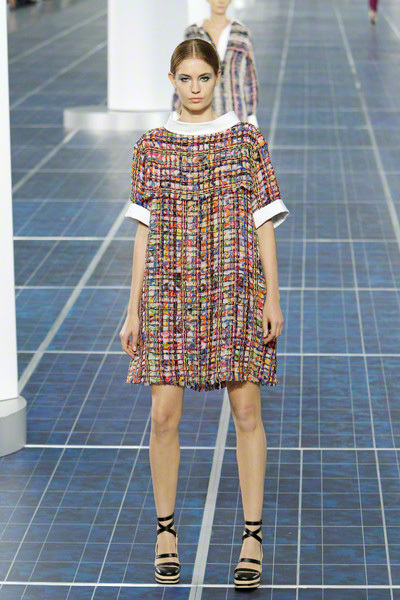 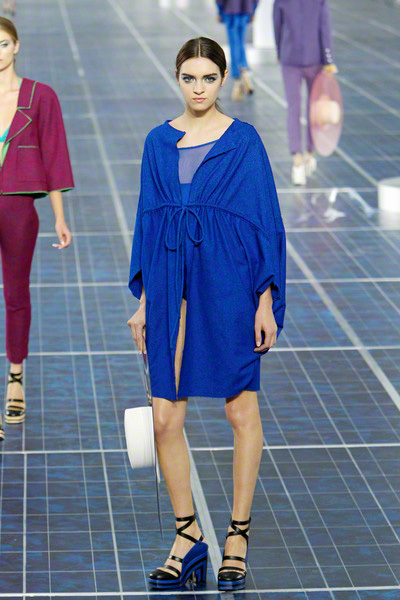 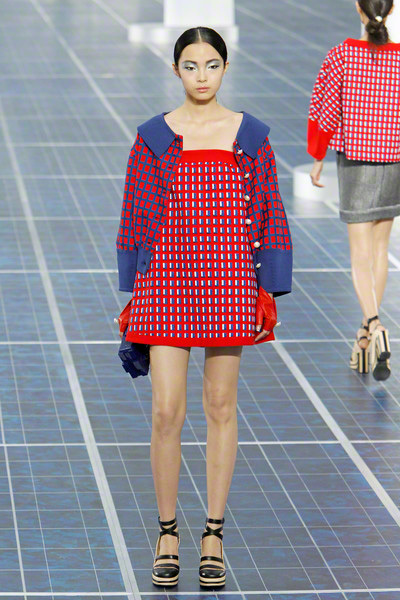 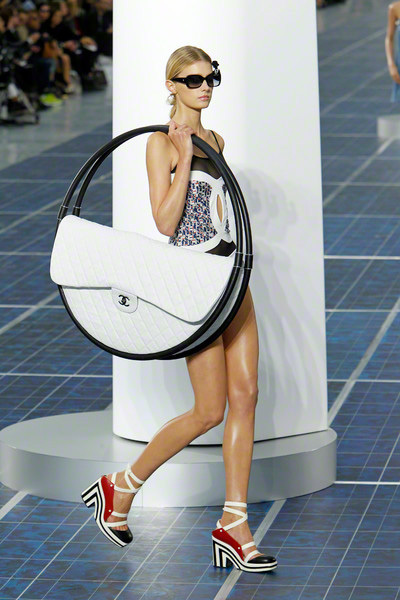 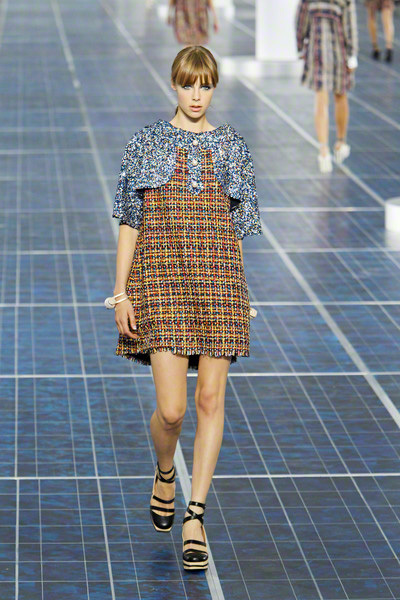 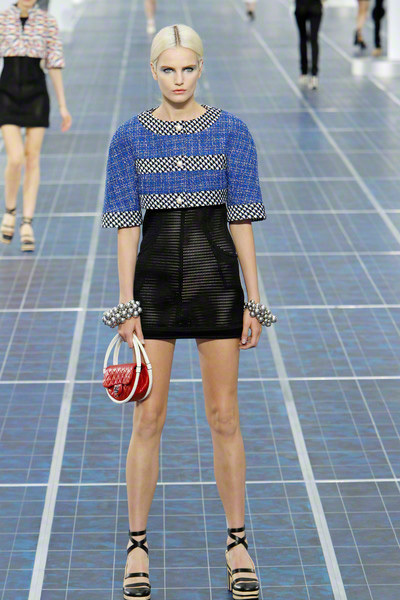 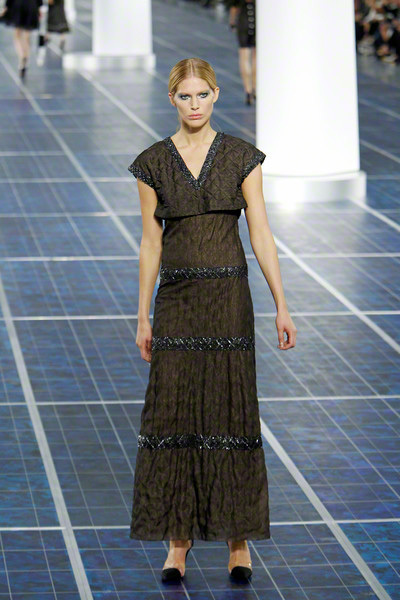 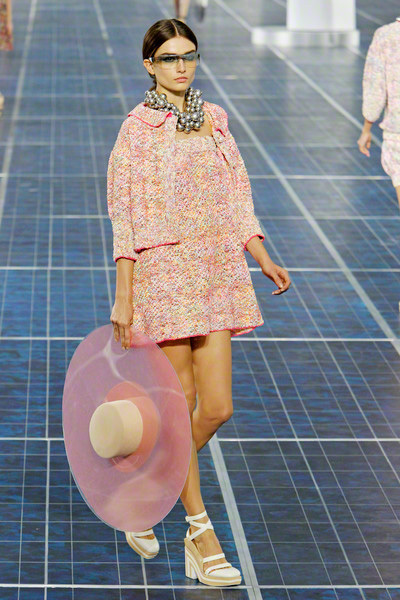 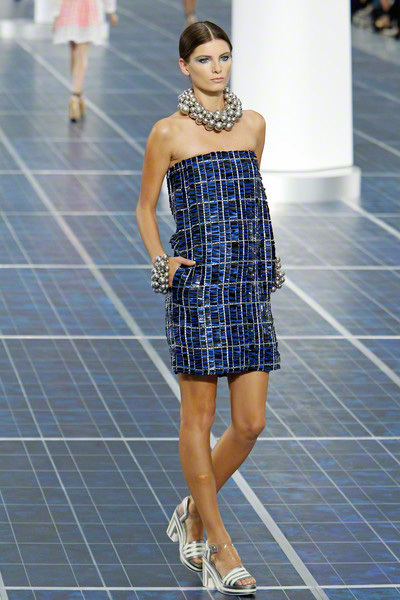 At least, so it seemed at Chanel’s SS2013 show at the Grand Palais. 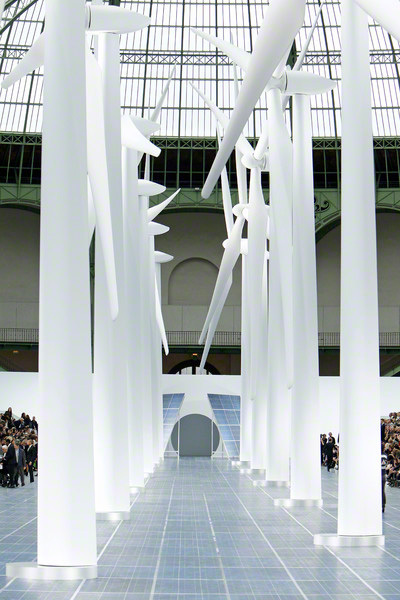 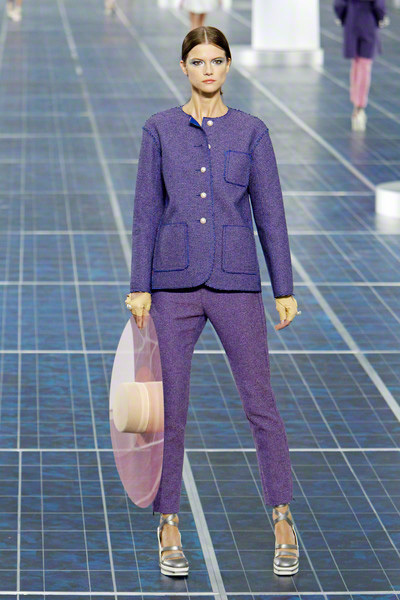 Fake windmills and a catwalk painted with the image of solar panels formed the backdrop for the collection presentation. 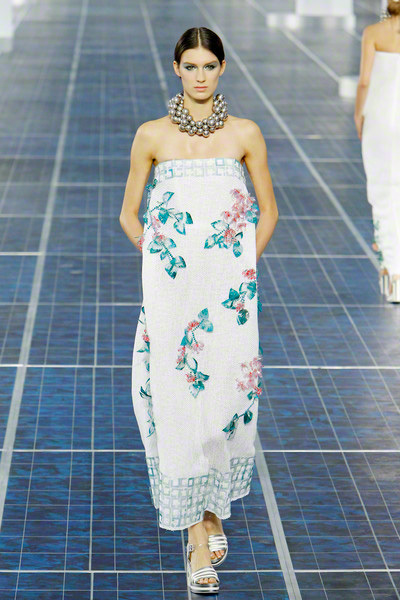 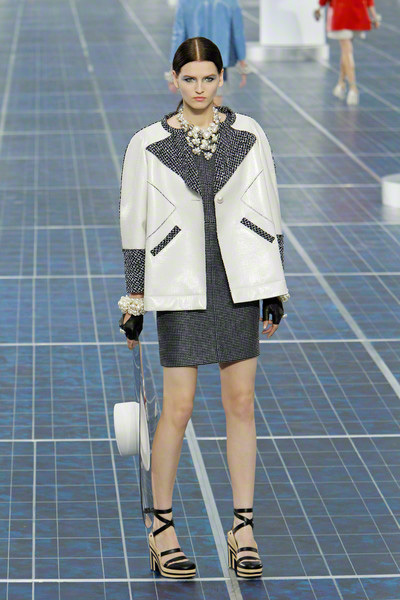 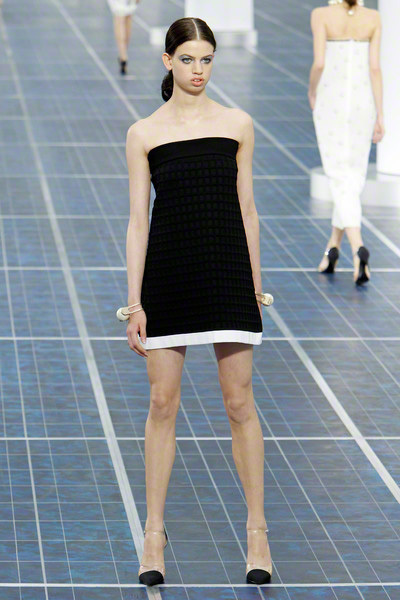 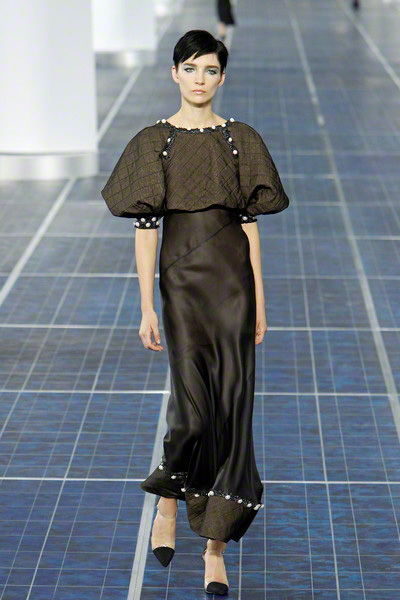 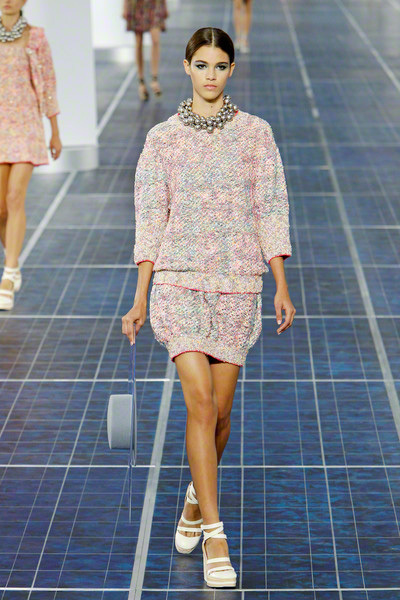 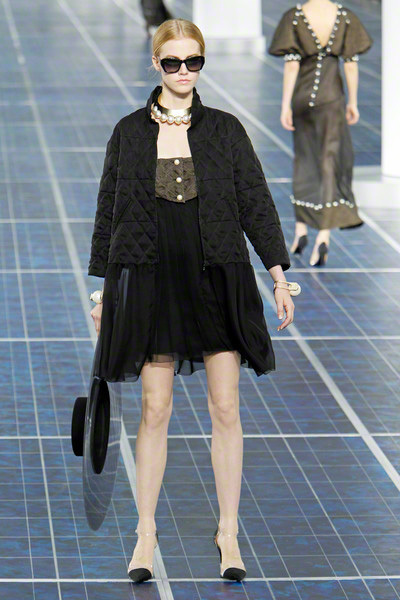 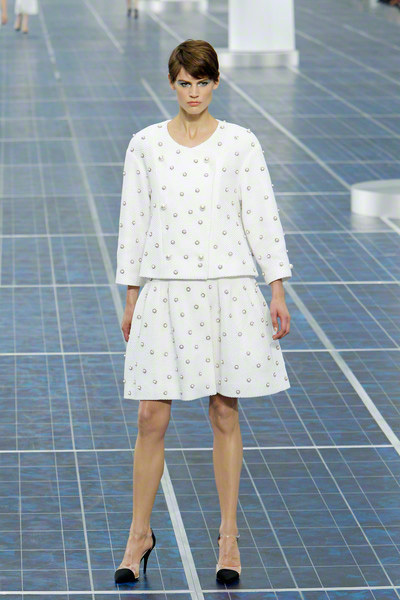 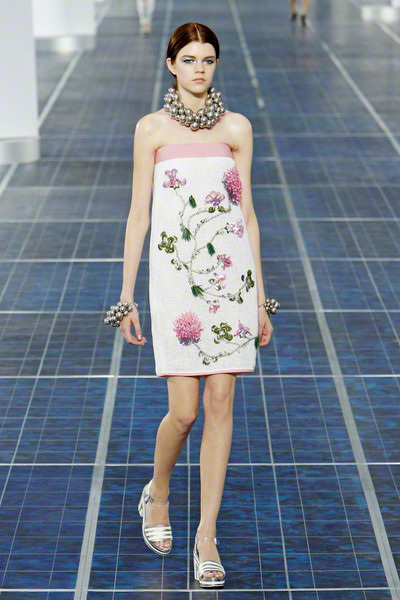 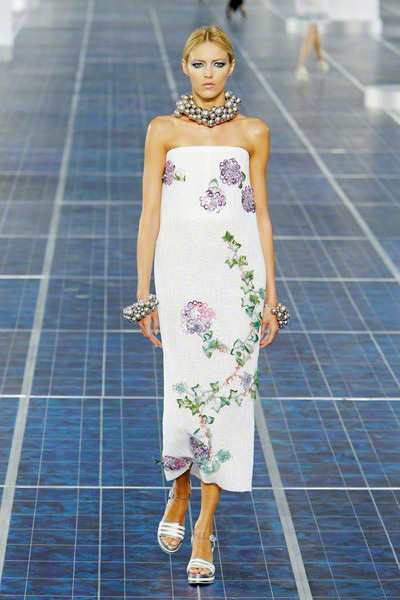 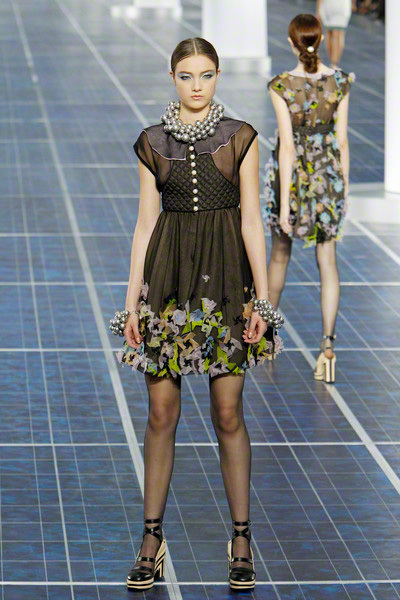 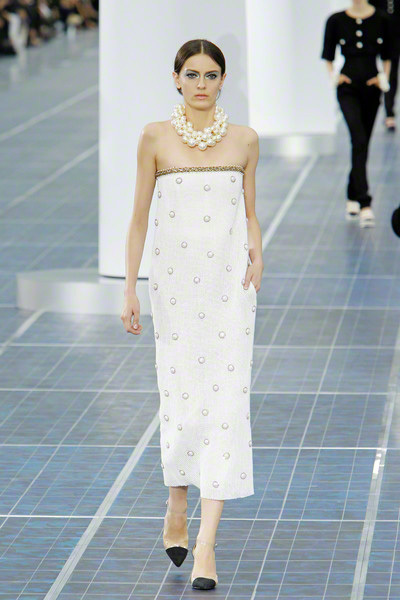 Chanel’s image for spring started off with classic looks; skirt suits and strapless dresses decorated with pearls. 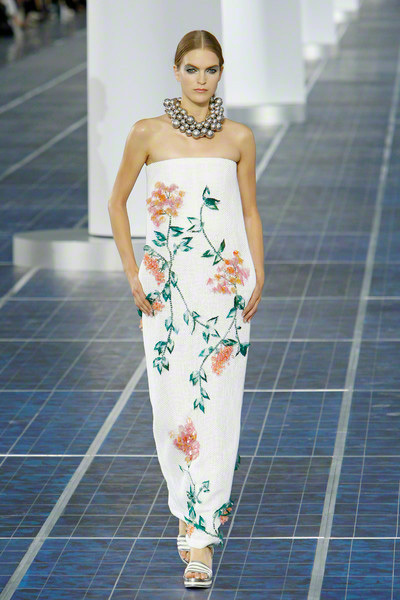 Pearls that kept popping up throughout the entire show. 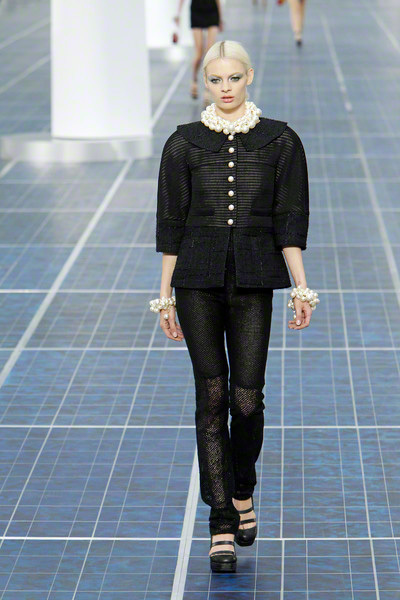 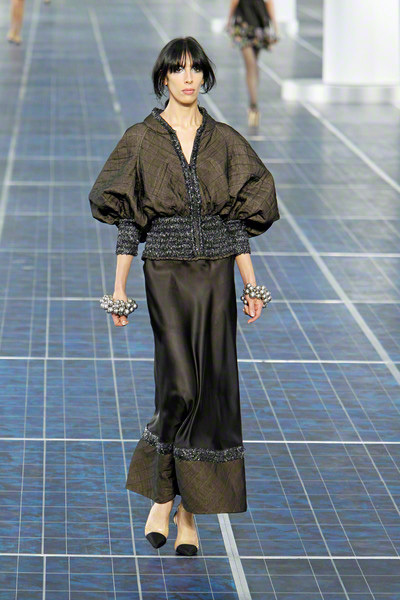 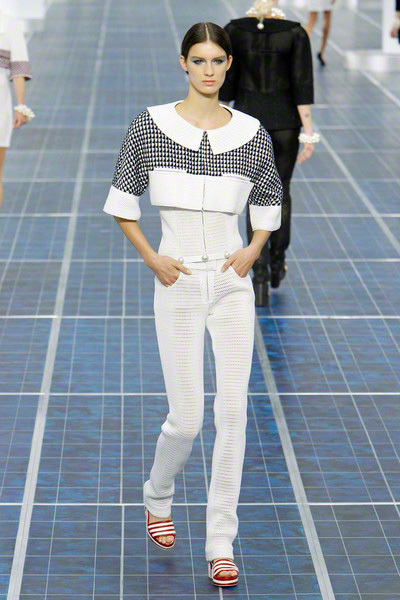 A show filled with renewed loose fitting Chanel suits. 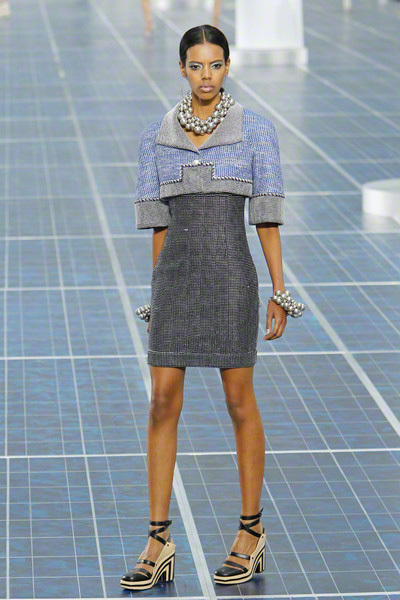 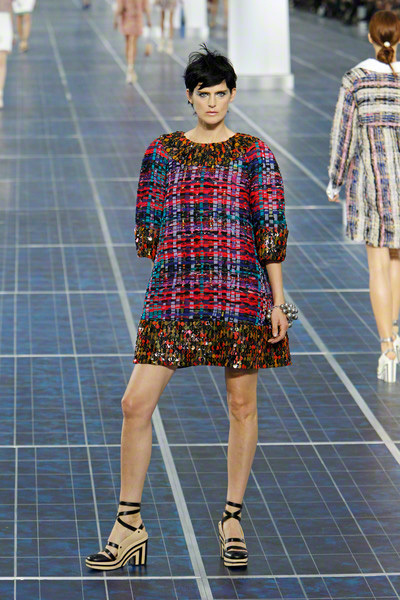 Tweed fabrics, the usual suspects at Chanel, were done in bright, almost fluorescent shades, which added a young touch to the collection. 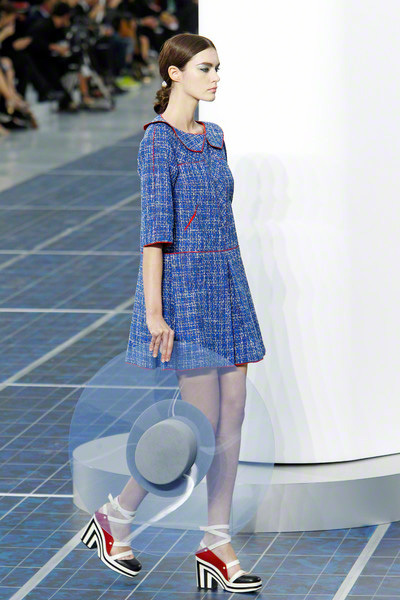 Plexi glass hats to match. 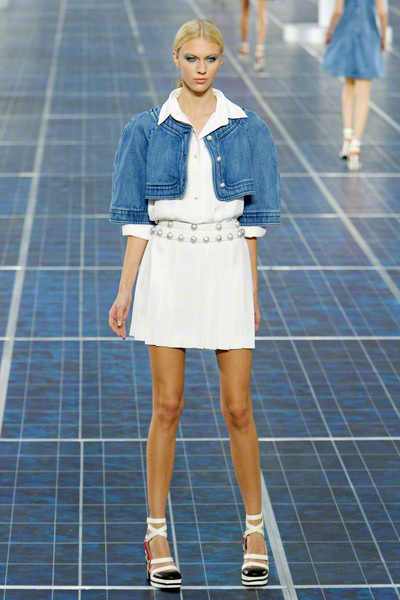 Mesh, patent leather and even denim made up for some unexpected creations. 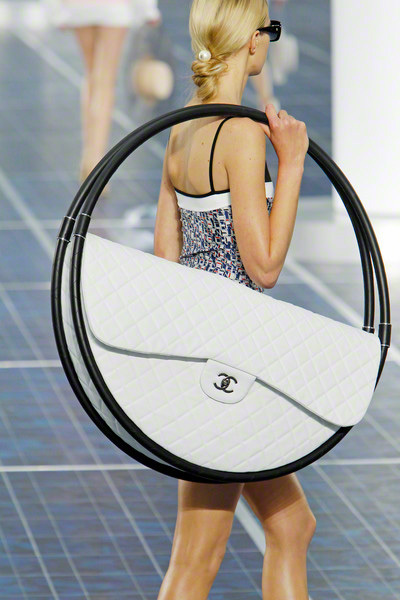 A sheer CC bathing suit was given a little more ‘body’ by an enormous Chanel beach bag, which had straps as large as hula hoops. 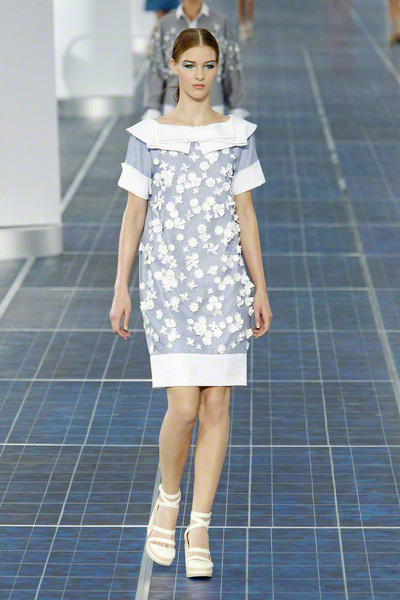 Designs were decorated by large collars, cute windmill appliqués and floral 3D embroideries. 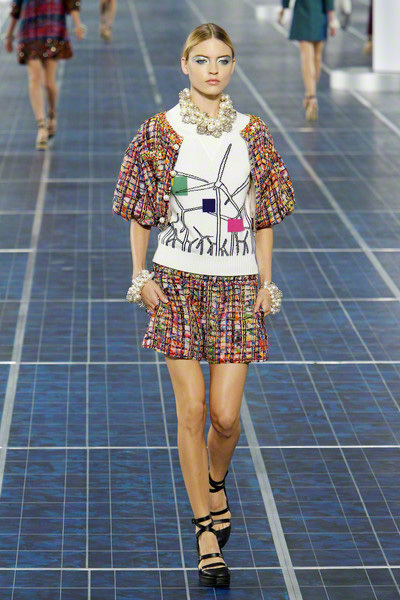 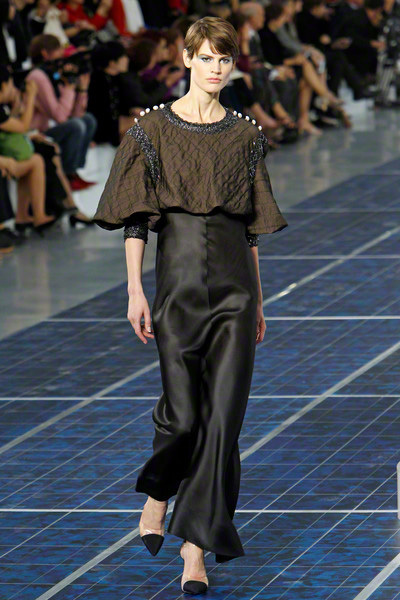 An eastern twist was given by colorful folded origami windmills on several sheer black looks. 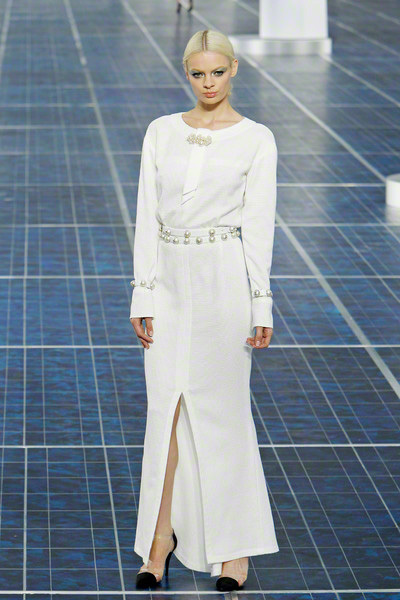 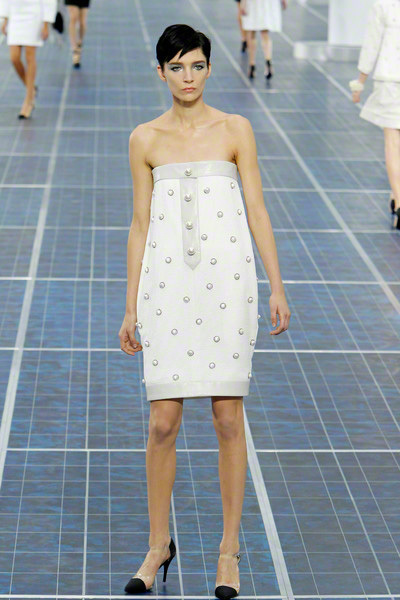 They were followed by a few quilted pieces as a series of white dresses closed the show. 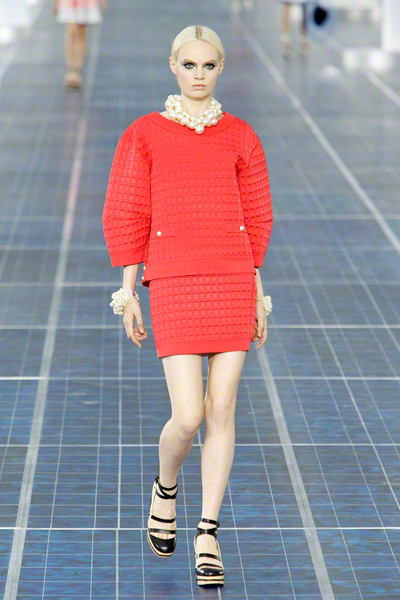 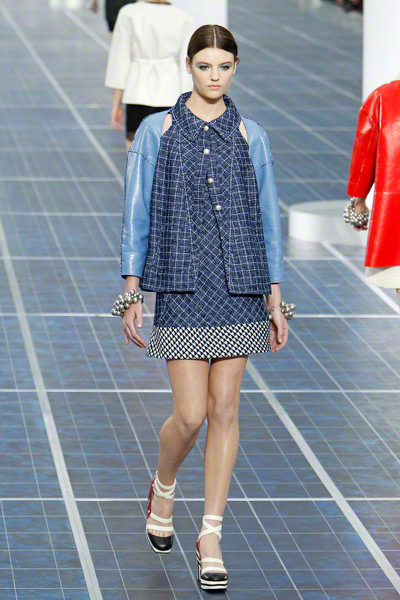 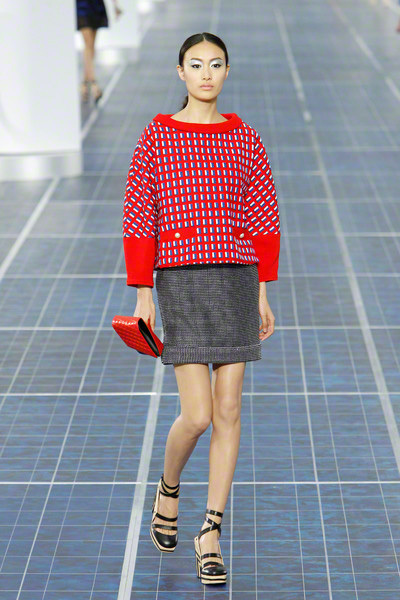 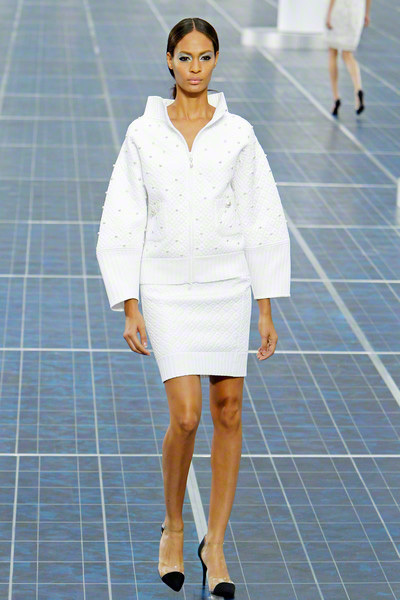 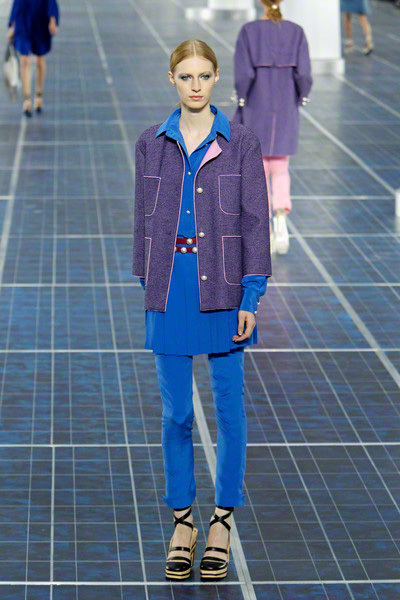 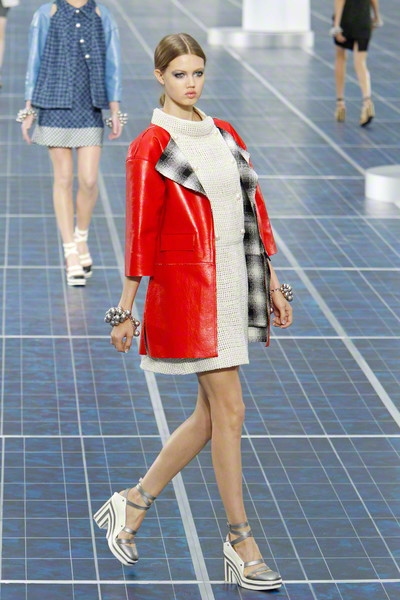 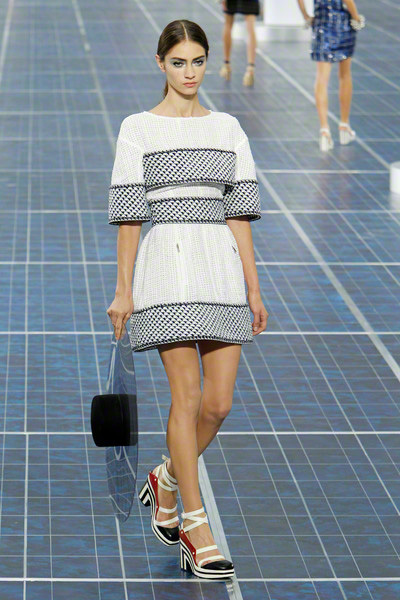 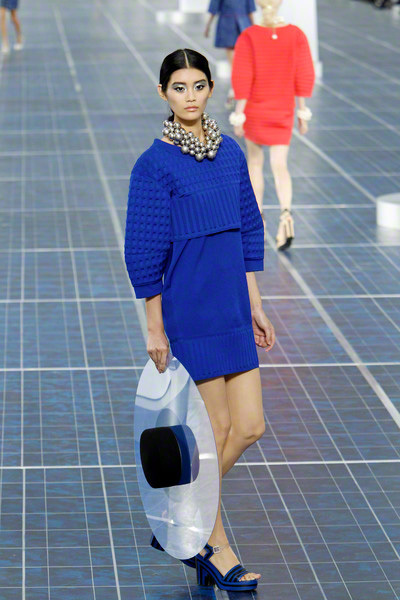 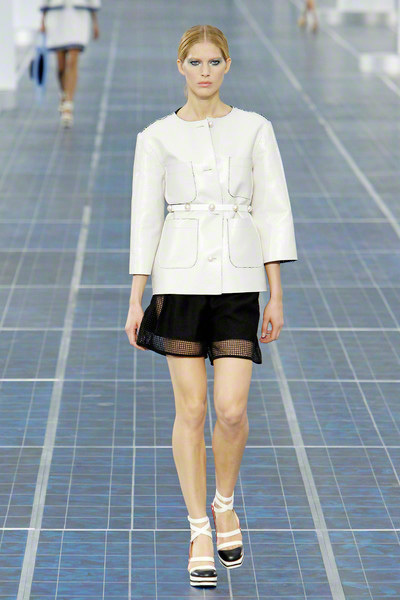 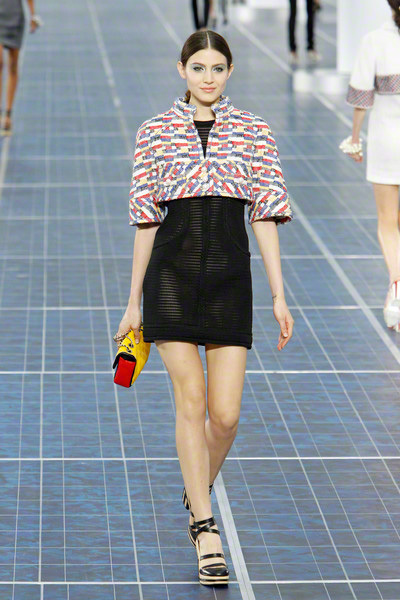 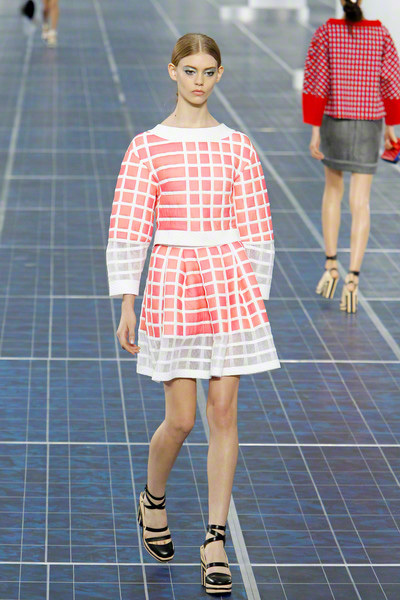 Karl once again succeeded in reviving Chanel’s archive pieces with a welcome youthful, sporty and Eastern inspired touch.